I would like to know what options does one have to curse someone from a distance. I don't really want to go to the person's house to do much. That is, I don't mind going to their house, but I don't want to have to dig and bury anything while I am there. What would be efficient in crossing or cursing an individual from a distance? What items would be recommended? Oh their are all kinds a ways to do work like this. You could do a candle spell, get a figural candle either a lady,gentleman,Eve,or Adam style candle and carve their name into it and dress it with crossing oil or something stronger. burn it on their photo that you've written tier name on the back or a petition paper.Dispose of the leftover wax and paper/photo in a graveyard or at the crossroads. Make up a bottle spell. Put nine nails,nine pins and nine needles in a bottle with something of theirs, a hair, nail clipping or the like. Add some oil like Crossing, Damnation,Destruction or Black Arts. Followed by Goofer dust and or the graveyard dirt of someone that died bad. Top it off with War Water. Now traditionally this would probably be buried where the person would walk over it but you can keep it and work it by shaking it as you call curses down on them. And of course their is the famous Doll Baby. Sew it up and stuff with Spanish Moss and again something of the person you wish to represent. Baptiste and name it for the person. From that point you have a rang of options, you could blindfold it to blind that person to your actions, bind its feet to give them leg trouble, that kind of thing. And of course you can dress it with oils appropriate to this kind of work or dust it with powders. If you really want to hurt them bury it in a graveyard in its own little coffin with a little grave marker with that persons date of birth and a date of death. And you must take care to cleanse yourself after such work, a Hyssop bath with the 51 psalm is a good way of doing so. Making a poppet doll/baby doll was an effective way when I did this. I stuffed the doll with herbs such as poppy seeds/witch grass in the head for confusion and anxiety. Also red pepper flakes. I mean it depends on your objective, and what you are trying to do. Just be creative, and treat the doll as if you are dealing with your enemy. You can stick pins in the doll like in the genital area if thats what you are trying to torture them with. Also, attached a string to the doll, and then tortured the doll in the fire of a black candle dressed with the appropriate herbs. I would only do this if the person really has pissed you off, and if you want to create some misery in their life. I like burying these in the graveyard with a nice nasty helper spirit. I WANT TO CAUSE COMPLETE AND UTTER CHAOS IN A COUPLE'S LIFE. I HAVE BEEN HURT EMOTIONALLY BEYOND REPAIR. I ONLY HAVE PICTURES OF THIS COUPLE, AND NO OTHER PERSONAL CONCERND. I CONSIDERED DUME BUT DEATH WOULD BE TOOO GOOD FOR THEM. WHAT IS A REALLY HEAVY DUTY SPELL? CROSSING VS. DESTRUCTION VS. CURSING ??? WHAT WILL BE THE HEAVIEST DUTY SPELL. I TRIED OTHER SPELLS ON THEM ALREADY LIKE REVERSING & BREAK UP. WORKED BUT DID NOT STICK. I WANT TO LEAVE A WELL DESERVED DENT IN THEIR LIVES. GRR! Well, you may want to get a reading to see why it did not stick. I would consider getting a reading and see what is the best approach.Also to see if you are capable of doing crossing work. 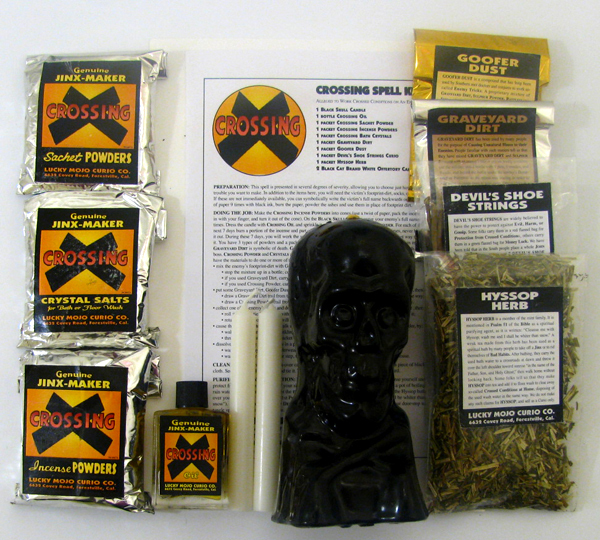 You may want to consider a crossing spell kit as well. CaliGirl, i suggest a reading. There are things about what you wrote that do not ring true to me. You say that you are "hurt beyond repair" yet have no personal concerns beyond photos? Usually, if someone was close enough to hurt you that badly, you would have evidence of intimacy, at least to the point of handwriting samples.... if not bodily concerns. Either that, or a long time has apssed, you've cleaned out your living space, no intimate items remain, but you are still brooding. I don't question your desire for revenge, but you are sort of thrashing about here, asking for "what's stronger" and complaining that your own attempts to break them up have failed. Why obsess about breaking them up? Why not just give them both a failed business or lost employment, followed by inoperable cancer or a car wreck? Be creative! If God sees the justice of your cause, their punishment will come due. Maybe it's the fact that you are typing in ALL CAPS that strikes me as unfocussed and less-than-likely to succeed, but i suggest you focus on your own life at this point. In another thread you asked about Cut and Clear spells, and i suggest that this may be a better way for you to spend your time and energy. Making YOURSELF happy should come before making them sad. "Is destroying their lives going to put money in your pocket, bread on your table, or presents under your Christmas tree?" I have never yet heard anyone answer "Yes." I agree with Miss Cat and Miss Michaele. Revenge may bring some temporary emotional satisfaction, but it usually won't bring anything positive into your life. Cut and Clear is a better use of your time and resources. @Starsinthesky I have contacted an airr worker, who's accepted my case. I was seeking ideas on the strongest thing I could do until then, but yeah I'll leave it up to the pros. @MissCat Sorry! Those caps really do look ugly after some sleep. I have a few handwriting samples, but they are behind their childs pictures. I dont want to affect the child, can a rootworker use that? I paid alot of money to move to another state, rebuild my life, and this guy just took years out of my life and tossed me in the trash. Worst part calling me and telling me I'am a joke to him and his bm...what sick,twisted,evil people we have in the world...hurting people this bad and considering their pain laughable. I want my revenge (great ideas btw) and then Im cutting and clearing. Im usually a different person...but some people need to feel what they do to others. As they say, sometimes living well is the best revenge. Show him what he is missing out on. Is there anyway to put creatures inside a person from a distance? That is without feeding them anything? Trying to do it for someone but the target lives far off. Or you could just do a crossing spell, and cross them to feel like things are crawling inside them etc. They way of working this trick is by feeding. My suggestion is to get Hoodoo Herb and Root Magic to learn more about the topic. Honestly, it is a cruel and unnecessary act so I recommend that you take some time thinking this through. Since this question isn't about any products used by LM I shall now be locking it. Here is the link to Hoodoo Herb and Root Magic as recommended by ConjureMan Ali. It is a comprehensive manual that includes accurate botanical information about roots and herbs. It is a very easy and excellent read. Enjoy! I don't know who these people are in real life, but I'm determined to punish them. I used to be part of this social website that didn't require you to reveal real life information, but then a lot of the users on there decided to ostracize me until I would be forced to leave the site. Now I want them to suffer. Is there a way I could do that? Preferrably with very harsh punishments? Possibly something like sending a demon to plague them? EDIT: Thank you Mary Bee for the help. ^_^ And I've changed my mind about punishment, since I was upset. I'm fine just shutting them up. If you don't know their real names, print out their screen names or avatars. Get a Lucky Mojo Stop Gossip bottlespell kit and put all their printouts in the bottle, and work the spell; it will shut them up. If you want to punish them, get yourself a Crossing Kit and carve the people's usernames on the black skull candle, or just carve "All Those Who Speak Ill of Me on xxxx Forum". Thanks! Where would be the best place to deploy the Stop Gossip Bottle? Would it be best to make it into a "shaking bottle spell" since the work is ongoing? If yes what liquid should I add to it? Would the pre-fixed bottle have the right liquid already in it? And when I put the candle in the neck of the bottle and say the spell, should I let the cnadle die out completely? You can shake up the Stop Gossip bottle, they're meant to be worked in that way. You don't have to add a liquid; the bottle will come with instructions and materials already in it. You would add your petition to the bottle. Yes, you should let the candle burn out completely in the neck of the bottle. My hat's off to you Luckbewithme876. Why? Because you set back and gave thought to what your intentions were for this spellwork. On a personal note, I understand the first inclination is to strike and strike hard in response to someone who has hurt you. But it takes a lot to sit back and rethink the situation and if it is really worth your energies to Cross up someone, believe me oftentimes it is a requirement. Good luck in your work! @MaryBee thanks for the reply. This will be a lot of help. @jwmcclin Thanks for the compliment. Though I mess up I certainly try to be ethical when it comes to magic and life in general. Do you have to stay with the cursing/crossing candle? When you are doing this type of cursing/crossing work or any type of work at all; do you have to stay in the area that you are burning the candle or doing the work the whole time? Can you state your petition and stay there and meditate on it for a bit and then leave that perticular room? Or if you are burning a 4 hour candle, do you have to stay there concentrating and praying for the whole 4 hours until the candle has burnt down? I have been wondering this for awhile! Yes and No, its your prerogative. Some do...some don't. Well, I dont know about everyone else, but I can't sit there an meditate for four hours straight on a candle. That's too long to me, and not necessary, but if someone can do it more power to them. Now if I am burning the candle for a number of days, I may repeat the petition throughout the day, but most of the time I just state the petition once a day until the candle is burned out. Thank you jwmclin and starsinthesky7, this information was very helpful! I can't meditate for four hours either. However, candles are open flames and so there's a safety concern there. I always stay with a lit candle--if I'm leaving the room for any length of time (cooking, playing with the cat, going for a walk, etc.) I snuff it out and relight it when I'm physically with the candle. You don't want it falling over, burning down to the holder and heating it up too much (I've had glass holders explode before! ), or any number of misfortunes happening. If you did the spell right it will still work--and the Gods understand not wanting to burn your house down. 2. Put them in sand or dirt. Jumbo or vigil candles can be burned in a heatproof dish with water. 5. If you have a cat that won't leave things alone, don't leave the cat in the room or leave the door open. Shut the door. 6. Use 4 inch candles that burn less two hours. Re: Do you have to stay with the cursing/crossing candle? Those are definitely GREAT suggestions from Mama Micki. Some are just common sense that some people forget. 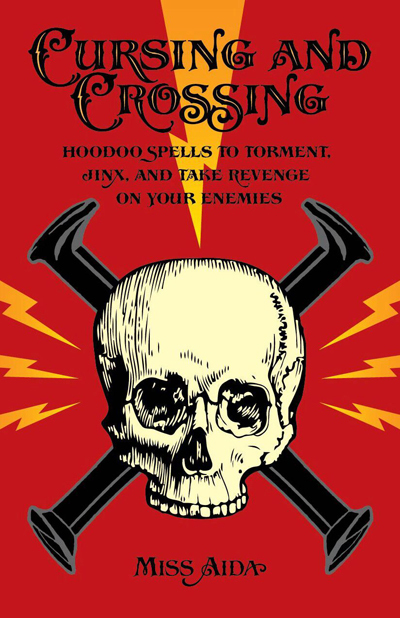 Hi, I was just curious if there are any revenge spells you can do where you don't have to be near the person, to make something touch him or her. Also, if you don't have any traces of them like hair or anything, would it not be so effective? Last edited by Mama Micki on Sat Sep 15, 2012 5:53 pm, edited 1 time in total. Yes, long-distance spells can be effective. A personal concern with DNA like hair or bodily fluids would help, but a picture can work also. Thanks for answering Is there anything on Lucky Mojo for long distance spells? Don't want them to know who sent the spell? Got a spell I'd like to send someone without them knowing who its coming from. But with the package marked by the post office with the city I live in it'd be easy for them to figure out. Is there anyone here in the same predicament? So long as we are in two different cities, we could switch. I mail my spell to you in your city, at the same time you mail me yours. Once received, your spell will be mailed out from my city, having no connection to you. You will do the same with mine. Our targets receive spells that are not traceable back to us. Heck, this sould be set up as some kind of regular occult service as I'm sure lots of people are bound to have thought of mailing out spells but wondered how to do so anonymously. Re: Don't want them to know who sent the spell? I beleive you can send a package without a Return Address. Also you can ship it from an Out-of-Town Post office. This post was moved here btw. I never said the spell was or a curse, or even that the person was long distance. Brry wrote: Wouldn't that mean the person driving out of their city in order to mail it? That would be inconvenient for someone who doesn't plan on leaving their city any time soon. Well, what is more important, not having your city on the package, or not suffering the inconvenience of driving out of town? Its one or the other I am afraid. Turnsteel - You must have missed the original post. There is a much easier solution: Switching with someone who is in the same predicament. Have done it this way in the past with a friend who lived in another country. Works great. So long as the people are in two different cities/states, they can switch. You mail your spell to a friend; at the same time they mail their spell to you. (Postage pre-affixed) Once received, their spells will be mailed out from each others city/state, having no connection to them what so ever. Their targets both receive spells that are not traceable back to them. Those of us here might have lots of friends in different cities and states, but they don't practice magick, and we don't want to explain why we need to send a mysterious package. That's why here, in a magical community, we could come together and rely on each other to further our conjure work. Heck, this should be set up as some kind of regular occult service as I'm sure lots of people are bound to have thought of mailing out spells so they can properly 'hit' their target but wondered how to do so anonymously. Thank you for that quick note, I have been looking for different ways to accomplish this very ritual - as I am new to doll babies and poppets. A picture is a weaker link than something with actual DNA, such as hair, etc., but can still be effective. How do you know whether anything has happened if your target is in another country? In working someone from a distance, you have to get creative. I just recently discovered that envelopes my target has licked are great to use as a personal tag. Yes, petitioned Saint Anthony when I had lost or couldn't remember these items. He has always come through. Thank you Saint Anthony. Working with Aunt Sally's Lucky Number oil and some Master Key might work well in this case although I've never given it a try. Just a thought. Hi songfinder, I don't really have any advice, but I just want to clarify. Are you looking to remember a password that you forgot or are you trying to find out another person's password? Yes, that's what I was going to suggest. If she sends you anything--assuming she licks her envelopes--then at least you'll have something. Another idea, have you considered sending her something? Like dressing a gift or card with a negative sachet powder? I'm going to perform a ritual for the first time for revenge against a person who has made me suffer without any reason. I need to know if I need to protect myself in some way before and after the ritual. The person I want to "hit" has no knowledge, and it does not know that I'm interested in these things. Thanks to everyone who can answer, I apologize for my bad English. Yes, you must protect and cleanse yourself. Doing revenge work with out having at least the most basic protection before hand is very risky. And you must cleanse yourself afterwards. Thanks for the reply, I'm reading with great interest. I forgot to tell you that the person I want to hit is thousands of miles away from me. Does anyone have other methods of protection in addition to the hyssop bath and burn white candles that I can prepare myself? Do you have any personal concerns? Working over thousands of miles is difficult for most beginners unless they have some good personal concerns. In addition to the hyssop bath & white candle you could consider cleansing your home with a dash of Buffalo Ammonia and Chinese wash and burn some protective incense afterwards, like LM Protection Incense or Basil for example. Cursing someone from a distance is done quite often -- but the Hyssop and white candle are not for protection. They are for cleansing, specifically the removal of sin for cursing. Cleansing would have nothing to do with the distance. It is simply a traditional way to work. You would use Chinese Wash. You could use Van Van Oil in water. After you cleanse yourself, you will also need to protect yourself. These are two different things, you see. 1) To protect yourself from being found out as you work (again, whether at a distance or up close) you want to work shielded -- for instance in a room in which the four corners are protected by Bay leaves, Arrowroot Powder, and seals, coins, or amulets of protection in the four corners. So that is Protection Number One. 2) Then comes the Curse. You are in the cursing area of the board now. 3) Then comes the Cleansing. 4) Follow this by further Protection if you feel that there is a possibility of being re-attacked. Even if you do have the password for someone's FB account and email, companies like facebook, google and yahoo have software to log the IP address for each log in - so if the other person ever got suspicious about someone else logging into their account, they could get the log in history and possibly prove that you were hacking into their accounts. If I'm not mistaken, hacking is a federal offense with a five year prison sentence. Good luck and I hope your situation works out for the best!